One of the best news in beginning of 2010 that the great band INNER DAM, from Orange County, N.Y. have gathered to make a FULL discography. 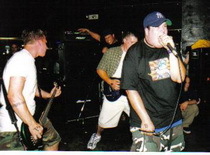 The band began in the fall of 1995 and made a good scene in mid 90's metalcore. Influenced by UNBROKEN, MORNING AGAIN, SLAYER, GREEN RAGE, 108, UNDERTOW, CHOKEHOLD, STRIFE, CRO-MAGS, BURN, etc. "Through the Eyes of Suffering" demo (0RINAL MIX). "Through the Eyes of Suffering" re~..recording.....from 7inch. "The Day Everything Meant Nothing" 6 song cd. "compilation" songs....."Structure" & 108's "Killer of the Soul". (These songs were covered as pure inspiration to INNER DAM). And maybe practice tape which was Recorded in 1997 put on. Check out the INNER DAM site for band info. Self X True Records are very happy to be part of it and release discography in 2010. More info will be soon.